They are extremely playful animals but sometimes pacific white sided dolphins can pester larger whales with their playful antics. As a humpback whale was feeding at sunset, a large group of dolphins arrived to join the sea gulls who were collecting leftovers. 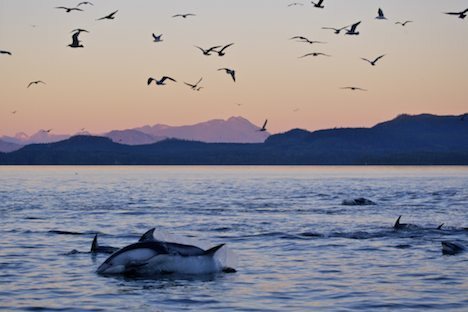 Pacific White Sided Dolphins, Lagenorhynchus obliquidens, off the coast of Vancouver Island at sunset, British Columbia, Canada. Picture of dolphins and seagulls in Johnstone Strait at sunset.